Best Interlocking Garage Floor Tiles 2019 - Review and Buyer's Guide. The method in which you tile your garage is absolutely essential; while you can get away with mats, a good tiling product can actually provide more safety and easier cleanup in your garage area. Fortunately, there is a wide array of garage floor tiles to choose from, but which is best for your particular garage? In this article, we’re going to show you five the best garage floor tile products and explain to you why they are worth your money. We’re also going to provide you with a guide so that you can know what to look for when you’re seeking out one of these products. These garage tiles are designed specifically with larger vehicles and loads in mind. To put it into perspective; the flooring can handle loads of up to 80,000 pounds, which means that you can park larger items on their surface like Class A RVs. Each tile is 12 x 12 inches and is about half an inch thick. The surface has a flat design with small diamonds that provide a good amount of grip. RaceDeck calls this their “diamond” design, and this surfacing reduces slippage, even when the tile is wet. These tiles lock into place without adhesive by using Power Lock tech, which ensures that the tiles will stay together throughout their lifetime. This ships as a 48 pack, which should allow you to cover most standard garage spaces. Unfortunately, this product doesn’t come with an edging lip, which you can use if you’re just laying the tiles down in a smaller area. Also, these aren’t waterproof, and liquids like water and oil can make their way in between the tiles. This product has a patented diamond substructure that’s designed to provide a decent amount of flex without being too soft for industrial work. This same unique design also inhibits the growth of mold and mildew and also provides a strong design that allows for these tiles to accommodate larger loads. Installing these tiles is also very easy; you can lock them together with a foot or a rubber mallet. The tiles from RaceDeck are also compatible with similar products from GarageTrac and CircleTrac. For those looking for an industrial-grade product, this might be a good choice. With its ability to manage loads upwards of 75,000 pounds, this is a good choice for busy garages. Additionally, these come in 11 different colors, so you’ll have extensive design options. These are designed to prevent slippage, even when they are wet. They lock together very firmly thanks to the Power Lock system. Strong material can stand rolling vehicles up to 80.000 pounds. These tiles are very easy to install. There’s no waterproofing – despite their strength and Power Lock connections, liquids can slip through the cracks. Unlike other products, this tile kit doesn’t come with edging. These Speedway tiles are designed with a diamond pattern on their top surface, which makes it fairly easy to achieve a stable grip on the tile. As with other interlocking garage tile products, these are fairly easy to place down, and you can secure the connection by simply standing on the aligned surface. Each tile is 12 x 12 inches, and they are designed to prevent the accumulation of mold. These also come in a wide variety of colors, which means that you can purchase these in patterns. While these tiles are very strong, you can inadvertently crack them with a rubber mallet during installation. Most of the surface does not have a diamond pattern. If they get wet, the tile can be slippery. These aren’t 100 percent liquid-proof, and spilled liquids can work their way in between the seams. The diamond pattern provides excellent grip for most footwear, and the pattern itself isn’t too raised above the surface. This means that you’ll be able to clean these tiles with relative ease without worrying that crevices aren’t being reached properly. Also, with 50 12 x 12-inch tiles, you’ll be able to cover a large-sized garage. For those that want a more industrial covering for their garage floor, these Speedway tiles work very well and are fairly sturdy. Additionally, they come in a wide variety of colors, which means that you’ll have some extensive design options. The diamond pattern provides good traction. There are 11 different color options to choose from. The tiles can crack during installation. When wet, the top surface becomes slippery. These Gladiator garage tiles are designed specifically to be extra tough for garage-style work. To ensure lastingness, the company has constructed these out of a fairly durable plastic that holds up against a lot of punishment. Each tile is 12 x 12, and each is rated to manage 250 pounds per square inch, which means that you can place quite heavy items on these. The pack comes with 16 black and 16 silver tiles, so if you prefer a single color for your garage, you may be disappointed. Additionally, these aren’t completely water-tight; some liquids can make it inside between the seams, but fortunately, this will be relatively rare. While these are very tough and sturdy tiles, they aren’t rated for larger vehicles. For those looking for a sturdy appearance in their garage, this product is aesthetically designed to look very work ready. The black and grey tiles each look metallic, and each almost feels as tough as steel. Each tile is textured to provide more than its fair share of stability and grip, and the product comes with black edging so that you can create a smaller protected area if you wish. This product from Gladiator works very well in most garages, and the inclusion of the edging allows for you to customize the amount of tiling you install. These are very sturdy tiles, and most people shouldn’t have a problem using them as a work surface or even as tiling for a small vehicle like a motorcycle or ATV. They have a two-toned design. Very strong, it’s very hard to crack or damage them. These are very resistant to chemical spills. The grey and black design won’t be for everyone. This is another garage tile product that has a diamond-style surface. The surface on this tile has more diamond protrusions, so you’ll have an easier time maintaining your footing, even when the surface is semi-wet. These are 12 x 12-inch tiles, and they are sold in a pack of 48, which means that there are more than enough tiles to cover a moderate-sized garage. GarageTrac designed these to interlock, and the system that they use really feels secure so that you won’t experience any tile “pop-up” or separation. Unfortunately, these aren’t 100 percent waterproof, and liquid may seep between the tiles. Additionally, while these will accommodate a vehicle with relative ease, using a jack on the top surfaces can cause damage. Also, with all of the raised surfaces throughout each tile, wheeled objects like office chairs can be hard to use on the surface. Once again, these are a product line of garage tiles that come in a few different unique colors. This really opens up your design choices, and the tiles themselves are easy to install in just about any garage. Additionally, these are very durable; chemicals shouldn’t damage them and rock salts during the winter won’t cause them to crack. The shock-absorbing substructure of these tiles is specifically designed to protect dropped tools from damage. If you need a product that you can use for a relatively large garage, these tiles from GarageTrac should do the job. They are even rated for most vehicles, which means that you can use them to make your garage area look amazing. These lock very securely into place. They are sturdy enough to support most cars. They are durable and chemical-resistant. This product is a 30-pack set of garage tiles that each have a 12 x 12-inch sizing. Each of the tiles interlocks to provide a completely waterproof seal that’s excellent for a garage environment. If you are looking for a product that can also be used on a patio or deck, this may work well for you because the tiles work well in UV-saturated environments as well due to their unique coating. With the 30-pack, you’ll be able to cover about 30 square feet of garage space, and the interlocking features make this a relatively easy-to-install product. While these are fairly durable tiles, they can break if you’re not careful. For example, a person wearing high heels might cause a crack in the surface of the tile, and since these are about a half-inch thick, a high heel can puncture down through the entirety of the tile. Despite being waterproof, there are perforations throughout the tile that might collect water and other substances. One of the primary advantages of this particular product from BlockTile is its price; there are several good looking designs that don’t cost a lot compared to other garage tiles. Additionally, these tiles are great for outdoor areas; their UV protection can be very useful in garages that get a lot of sun or even on a patio or deck. These are also very hard and inflexible and have the ability to hold a lot of weight. Overall, these tiles can be very useful in a wide variety of places, especially with their waterproofing and UV-resistance. Combine that with the fact that these are fairly budget-friendly, and these garage tiles might be what you’re looking for in your space. There are a few different designs. They cover 30 feet of garage space. The perforations can trap water. Small objects with a bit of weight can puncture them. When you are on the market for these tiles, you’ll find that there are two types that you should take into consideration: Flexible floor tiles and ones that are more rigid in their construction. In most cases, these tiles will be constructed of plastic, rubber, or PVC (polyvinyl chloride). As one might expect, tiling that’s more rigid will also be more durable, so if you are going to be resting multiple vehicles on the surface, then rigid floor tiling is the way to go. Additionally, this type of tiling, which happens to usually be made of 100 percent PVC, will also be very resistant to chemical spills, grease, and won’t crack easy if you happen to drop a heavy item on it. Need to jack up your car? These are great because they won’t buckle under the highly-localized pressure that a car jack can provide. More flexible tiles, on the other hand, are great for a garage that’s primarily used as a workspace. For example, while the rigid tiles might be durable and great for busy garages, no one would tell you that they are always comfortable to stand on. Rigid tiling is softer and more comfortable to work on over the course of the day, and the more malleable surface also provides a bit of grip and slip-resistance. Flexible tile is also less of a financial investment, and since most interlock, you shouldn’t have much of an issue tiling an entire garage in a day or so. In fact, some of these tiles are soft and flexible enough to be used in other areas outside of the garage. There are PVC variations of flexible floor tile, which are tougher. Just remember, that flexible tiling typically isn’t suitable for garages with vehicles. Interlocking tiles – As the name indicates, these are designed to be somewhat modular. When you’re using interlocking floor tiles, for the most part, you can simply step two independent tiles together using the step-and-snap method. Once the tiles are locked together, they are very hard to take apart, and in some cases, liquids won’t get between the adjoined edges of the product. The only issue with these is the fact that they don’t work as well for smaller areas, so you may end up spending more so that you can cover your entire garage floor. For some reason, interlocking tiles have a tendency to be a bit noisy when walked on, but you can use an underlayment to reduce the noise level. Garage Roll – Sometimes, you don’t need maximum coverage, and in those situations, roll-up or tab and loop tile systems work exceptionally. You can use these garage tiles underneath smaller vehicles like ATVs or riding mowers or beneath work surfaces, and they are still versatile enough to be used to cover large swaths of garage space. Some products are even rated to manage larger weights, which adds a lot of conveniences. These garage roll tiles have a tendency to be less noisy than interlocking tiles. So, why bother with flooring tiles for your garage? There are a lot of inherent advantages to using this type of tiling, but they might not be so obvious at first. In this part of the guide, we’re going to show you why you’d want to install one of these products. For Coverage – Throughout the country, many garage floors are made of concrete. Unfortunately, if you own your home or garage for a long time, your concrete flooring may start to crack due to weather and other factors. In addition, stains can also cause damage to your garage surfaces. When these things happen, you’re left with an unsightly garage, which is why many owners opt to use tiling to breathe new life into their workspace. For Style – In addition to the ability to cover up damage and stains, these can also be very stylish options. 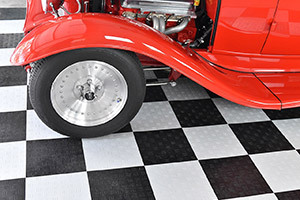 While a linoleum-style checkerboard floor may not seem inherently strong, you can actually purchase garage tiling that has this design and is rated to withstand the weight of several vehicles. Additionally, if you want to use unique designs, most PVC garage tile comes in different colors so that you can create patterns. For Safety – Wet concrete is a major hazard, and even in dry situations, concrete can be slippery. With garage tiles, you can add a surface to your floor that will grant you extra stability as you work. This makes for a much safer work environment. For Ease – While no one wants to retile their kitchens and bathrooms, adding tiles to your work areas can be very easy. In most cases, most products don’t even use adhesive. In fact, since the majority of the products on the market have some sort of interlocking system, it won’t take a lot of time to cover your garage work space fully. This type of tiling can be very versatile, it can make your workspace safer, and is very easy to install. Despite this, there are some considerations that you should take into account. First, on a per-cubic-foot basis, this type of tiling can be a bit expensive. Prices range wildly, but it’s a general rule of thumb that the more you spend, the higher quality the tile will be. Effectively, you can expect to spend more than three dollars per square foot for good quality tiling for your garage. Also, while these surfaces are well-known for their durability, it’s important that you understand that there will be required upkeep. You can expect to have to wax and buff some types of tile flooring so that it keeps up its appearance. Garage tiling can be great for just about any garage work area, and the products that have been featured in this guide are all very good at providing an excellent work surface. The realm of plastics has made many advances in floor tiles, that are already convenient to use. They will become tougher and durability, so that you’ll be able to protect the concrete floors of your garage area. I just purchased the GarageTrac Diamond, which is listed as one of the top five best tiles for garages. I love that they come in 12 x 12-inch times for easy installment and they have a great grip texture on them to ensure no slipping.